Often we do get a little muddled on our framing assessments for any innovation activity we are considering, and we then often don’t ask the appropriate questions at the right time. I think there is a neat four box approach to this which hopefully you might see has value to your rating and judgements of the innovation opportunity. So the need is to ask critical questions in given boxes of enquiry. Let me provide a short description of each framing blocks briefly. I feel you can expand within these for your own four-framing approach. These deals with a range of questions that should be asked at different stages of any innovation activity but are set out to establish the guiding approaches and scope. The Boundaries– how often do we set the boundaries for the way innovation should proceed, this question seeks the potential scope that can be explored. The Big Picture– often we miss the bigger picture as we delve straight into the problem or solution, having one can really help others see the potential and draw encouragement to expand on their ideas and contributions. Sequence and Clarity– the understanding of the sequence that innovation initiative should run through and providing the clarity as best as one can early makes for a more effective project. These deal with the different stages of risk investigation so it is better understood early enough. Organization Risks– the what are they as best as we can antiscipate and ideally updated as we learn more. Lack of Uptake Risk– the downsides are often ignored as innovation is hyped up. By making a ‘reasonable; assessment of the risks of the effect of a poorer uptake and a range of scenarios’ allows for some deeper reflection and need to attempt a better forecasting range early enough. So within each of these frames you are askng for a clarity on different critical questions that need clear seperation. I think it makes sense to ‘frame’ your questions from these different perspectives. What do you think? 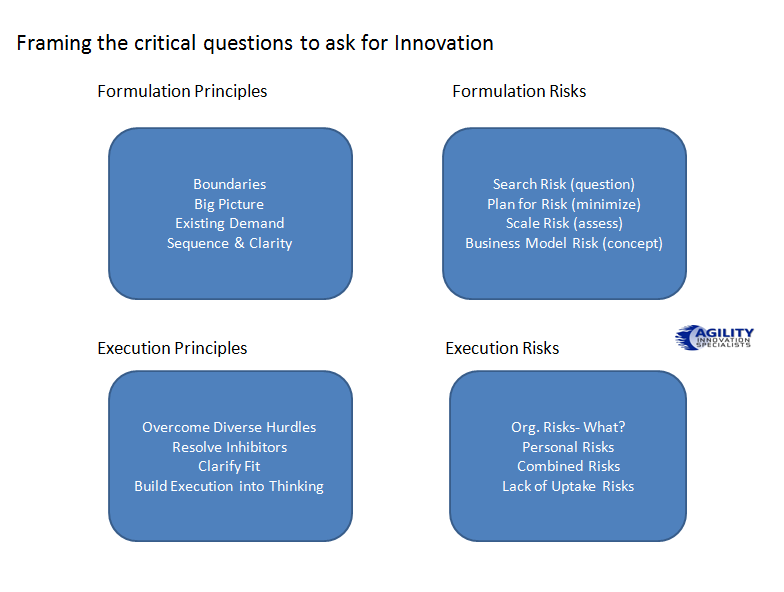 This entry was posted in Molecules and tagged critical question for innovation, execution of innovation, formulation of innovation, four box innovation, innovation framing, looking at innovation risks. Bookmark the permalink.